Enjoy the modern comforts of this luxury beachfront hotel situated on 23 acres with spacious, contemporary hotel rooms and suites overlooking the Gulf of Mexico. The hotel offers several dining options to include a fine-dining restaurant, beach bar, and Spressi Coffee Bar. 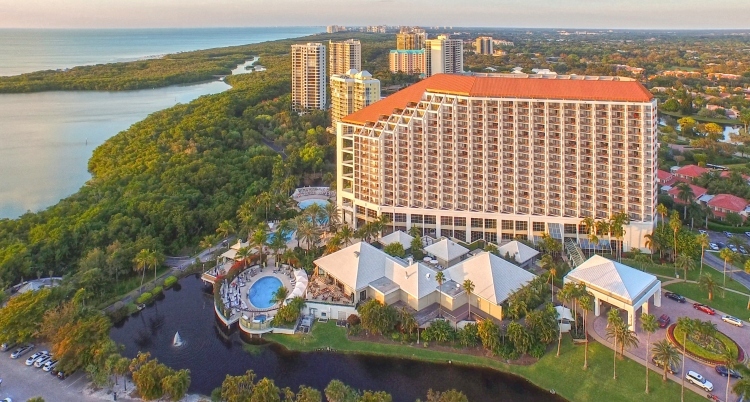 Other amenities include a par 72 championship golf course, 15 Har-Tru tennis courts, The Spa at Naples Grande, 24-hour fitness center, 3 outdoor pools, and 3-miles of powdery, white sand private beach. The resort is just a short distance from high-end shopping, Everglades, and Naples Zoo. Please note reservations require a deposit of one (1) night's room and tax by credit card to be charged upon the time of booking the reservation. The deposit is refundable provided the resort receives notice of cancellation at least (3) days prior to scheduled arrival. Southwest Florida International Airport (RSW) (Fort Myers) is located 29.9 mi./48.1 km from the Naples Grande Beach Resort, approximately 35-40 minute drive to/from the hotel under normal travel conditions. Please note there is no complimentary shuttle to and from the RSW Airport and Naples Grande Beach Resort. Below you can find many other ground transportation options to and from the airport. Fort Lauderdale–Hollywood International Airport (FLL) is located 111 mi./178 km from the Naples Grande Beach Resort, approximately 1 hour, 45-minute drive to/from the hotel under normal travel conditions. Miami International Airport (MIA) is located 125 mi./201 km from the Naples Grande Beach Resort, approximately 2-hour drive to/from the hotel under normal travel conditions. The IECA has secured with United Airlines discounted rates on flights to/from Southwest Florida International (RSW). When booking your travel with United Airlines, use the IECA's Meeting Z Code ZFHY and Agreement Code 816918 to receive discounts of 2% to 10% off published fares. Reservations can be made by calling your professional travel agency, available online via united.com and by calling United Reservations Meetings Desk at 800-426-1122. For passengers outside the US 50 States & Canada, you can also email groupmeetngs@united.com and provide your preferred itinerary, agreement code, and meeting Z code. Please allow 24 hours for email requests to be processed. MBA Airport Transportation, LLC is the provider of taxi service at Southwest Florida International Airport. MBA Airport Transportation is available to serve all walk-up customers, with no reservations required. MBA Airport Transportation taxi rates from Southwest Florida International Airport are defined by zones, not meters. The rates to the zones are regulated by the Lee County Port Authority and cannot exceed the rates listed on the Taxicab Zone Map. The rates are valid for up to three passengers; each additional passenger is $10. There is no extra charge for child safety seats and service or crated animals. Rates include any toll charges and are regulated from Southwest Florida International Airport to your destination only. From hotel: Taxis are available at the hotel 24 hours a day—just ask hotel staff and they will be happy to call one for you. Click here for a list of companies that provide pre-reserved, shared ride and other ground transportation services. Additional providers of ground transportation may be listed in the airport on the directories in the baggage claim area or the brochure available at the Ground Transportation Information Booth on the lower level terminal curb by Door 3. For more information, you can call the Ground Transportation Booth at 239-590-4738. IECA has partnered with Hertz for discounted rates on rental cars. To reserve your special meeting rates, please provide the CV# 053Z0001 when making reservations. You can make reservations online at www.hertz.com or call Hertz Meeting Services directly at 800-654-2240 (US and Canada), 405-749-4434 (outside the US and Canada). At the time of reservation, the meeting rates will be automatically compared to other Hertz rates and you’ll be quoted the best comparable rate available. *For guests who self-park, we recommend dropping your luggage and travel companions at the front drive prior to parking, as there is no elevator directly to the lobby from the garage. The staircase to the lobby is located in the center of the garage. Guests are welcome to use the pool elevator from P2 (first garage as you enter the resort) which will bring you to Sunset Veranda which is located on the lobby level. For driving direction to the hotel, click here.